January 25, 2018 - New Yorker Electronics, a global electronic components distributor for 70 years, has announced it will now be a distributor for MoxiE Inductor Corporation. 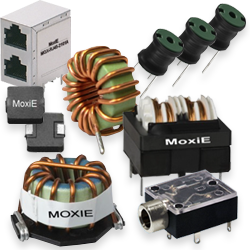 MoxiE Inductor Corporation is a manufacturer of inductors, chokes, coils, LAN magnetics, and transformers. MoxiE offers a vast inventory of power and transformer products used in lighting, professional audio, computing, industrial electronics, defense and power conversion applications. MoxiE’s product line of magnetics components are widely recognized for their reliability, durability and performance however a major feature is its ability to drastically reduce lead times and costs on very popular components. New Yorker Electronics’ customers also benefit from Moxie’s vast inventory of ISO-approved power and transformer products. Under the agreement, customers have a new, reliable source for MoxiE Components. New Yorker Electronics has been distributing electronic components for over seven decades and is a highly certified mil-spec distributor. “This means even more solutions for our customers from a quality source with a strong zero defect policy. Combined with our brand of personalized service that the giant distributors can’t match, this is a very beneficial arrangement for our customers,” said Barry Slivka, President of New Yorker Electronics. As a franchise distributor of MoxiE Inductor Corporation, New Yorker Electronics now supplies its full line of Chip Inductors, RJ45 Connectors, Power Inductors, LAN Transformers, Power Transformers, EMI/RFI Products, Inverter Transformers, Chokes, Current Sensors, Air Coils, plus audio magnetic products and audio transformers, and more. MoxiE products are available through the New Yorker Electronics Web site for sale and RFQ.